Well spring is in the air and that means it’s time to plan our GSSB Spring General Meeting. This year’s Spring General Meeting will take place on 20 Apr 19 @ 11:30 AM. 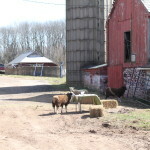 The meeting will be hosted by Bob and Diane May and their family at Swayze Inn Farm in Hope, NJ. We will have our general meeting, a farm tour and a session on participating in a breed up program including the use of CIDRs to cycle ewes, laparoscopic artificial insemination techniques and pregnancy check via ultrasound. As always dress comfortable and wear farm clothes. Meeting will be rain or shine and lunch will be served. Our general meeting agenda will include an update on our Youth Ambassador program, an update from this year’s ASI meeting as well as a report out on last year’s festival along with the plans for this year which is our 25th annual festival. For members in attendance we will have our ever popular door prize drawings at the end of the meeting. The May’s Swayze Inn Farm is located in Warren County, NJ and the address can be found in the Member’s Directory. 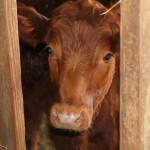 Bob’s email address is newjerseyjacobs@yahoo.com and the farm’s website is SwayzeInnFarm.com. This is an opportunity to meet the new slate of officers and interact with other regional shepherds in addition to learning about some breeding practices and experiences from seasoned breeders and a veterinarian who is a reproduction specialist. We would like to get a head count for lunch so please let Bob know if you will be attending as well if you may have any food allergies. 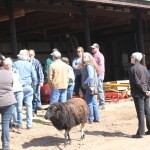 At the most recent General Meeting Dr. Linda Detwiler provided an update on the USDA scrapie program and the need for collecting samples from Sheep that are over 18 months old that die in order to meet the state sampling quota. Owners that allow for samples to be collected will be eligible for the free scrapie tags with your farm’s assigned premise ID. The importance of this program can not be overstated. If we are able to collect enough data from the scrapie monitoring program over the next few years, we may be able to declare the U.S. scrapie free which would open up a number of opportunities for U.S. Sheep producers. Since slaughter surveillance stared in FY 2003, the percent of cull sheep found positive at slaughter (once adjusted for face color) has decreased 90 percent. However, in order to declare the U.S. “scrapie free”, we must be able to prove to the world that we have conducted testing in all sheep and goat populations. This is why your submission of samples from sheep/goats over 18 months of age found dead or euthanized on your farm is extremely important. Without your help, we will not be able to declare the US free of scrapie, costing the sheep and goat industries approximately $10 to $20 million, annually. Information below is from the US APHIS website. Instructions for collecting and submitting samples. Happy first day of Spring – at least according to the calendar. Once again someone forgot to tell Mother Nature that winter is officially over as we hunker down for our fourth Nor’easter in 3 weeks. I am happy to announce that our 2018 Spring general meeting will take place on Saturday, 14 Apr 18 @ 11:30 AM. The meeting will be hosted by Anne Choi of Middle Brook Fiberworks in Bedminster, NJ. We will have our general meeting, a farm tour and a dyeing workshop that Anne will conduct so dress comfortable and wear farm clothes. Meeting will be rain or shine. Lunch will be served. Our general meeting agenda will include an update from Reni on our roll out of the GSSB Youth Ambassador pilot for 2018, an update on last month’s ASI meeting as well as a report out on last year’s festival and current plans for this year’s festival. Of course we will have our very popular door prizes for members in attendance. In addition, we are in need of electing a trustee to replace Royal since his term has expired. He has graciously agreed to remain on until a new trustee is elected. Nominations for this trustee position are now open and will be closed during our meeting. If you would like to nominate someone for the position, please reach out to an officer or let Andrea know. Alternatively, you can make a nomination at the meeting. Anne’s Farm is located in Somerset County minutes away from interstates 287 and 78. Her email address is anne@middlebrookfiberworks.com. This is an opportunity to get updates on our group’s events, meet and interact with with other area shepherds and learn about dyeing fiber in a hands on workshop from an artisan that does it professionally. We would like to get a head count for lunch so please let us know if you are attending as well as if you may have any food allergies. As the festival is the best time for many of us to get together, I would like to have a quick general meeting after the show closes on Saturday. Please come to the show ring bleachers in Barn 2 @ 5:15 pm for a quick meeting. I know it will be a long day so we will keep it short. For our first general meeting this year, we are targeting Saturday, April 22nd. Time and location to be determined as a host volunteer is needed for this meeting. If you are interested in hosting a general meeting or have topics that you would like covered during a general meeting, please let Reni know. As Mother Nature reminds us once again that she is the boss and delivers us a snow storm that feels more like February than mid-March followed by spring-like highs, I wanted to take the opportunity to send out my first message since becoming President of the group. First I want to thank Eunice Bench for her time, tremendous efforts and her tireless work as President for more years than she probably cares to remember I look forward to her support and learning her secrets on being a successful President. Additionally I want to thank her for continuing on as the Festival Committee Chair and taking on the role of Treasurer. Together with the other officers and committee members, we are planning for another great year for the club including a fabulous festival. 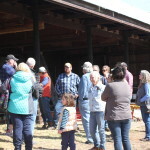 In addition to regular festival planning committee meetings, we will continue to have general meetings at member’s farms on a weekend date in an effort to increase our meeting attendance. For our first general meeting this year, we are targeting Saturday, April 22nd. If you are interested in hosting a general meeting or have topics that you would like covered during a general meeting, please feel free to let Reni or myself know. I have also set up a new email address for club business where you can reach me directly which is kmelvinnjsheep@gmail.com. I look forward to hearing from you and hopefully seeing you in person at our general meeting on the 22nd Once we have firmed up the logistics for the meeting including time and location, we will send an email and update the website with the information. The weather was spectacular, the hosts (Christian and Marci Bench, Meadowridge Farms) were great and there was a nice turnout! 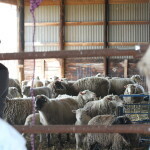 We started with a tour of the facilities, starting with a peek at the ewes and lambs the Bench’s are raising. One of their successes is selling to a restaurant in Philadelphia. They have a standing order of 8 lambs per week, but they must be of uniform size/ weight and the lambs must not have had any issues when growing up or the quality of their meat will be impacted. Not an easy job! They have also been experimenting to find the best cross breed that works for them. There are also cows raised for meat here too. They are beautiful! Next there was more discussion about marketing lambs in front of the pens holding older lambs. The final portion of the tour included a discussion of the programs available to farmers from the USDA. These include many areas from micro loans, Ag Management Assistance Program (AMA), no till methods, Northern NJ River Friendly Farm Program and environmental quality (EQIP) cost sharing agreements to list a few. We also walked through the on-site Bed and Breakfast run by Tullamore Farms. The Cooking School was running a children’s event so we did not disturb them to tour the kitchen. A lovely picnic lunch was held in front of the B&B followed by a general business meeting. The next meeting is scheduled for the 1st half of June and a volunteer is sought to hold the meeting. If you are a Northern or southern NJ or PA member who would be willing to host the meeting, please contact Eunice Bench as soon as possible. The general meeting for the club will be held on March 12th at 11AM. This will be held at Christian and Marci Bench’s home at Tullamore Farm just outside Ringoes, NJ. In addition to a general meeting, Christian will talk about marketing lamb and programs available for farmers to address resource concerns/ financial assistance for farmers as well as a tour of the bed and breakfast and farm cooking school. Please RSVP to christian.bench@yahoo.com or Cell Phone: (908) 399-4220.